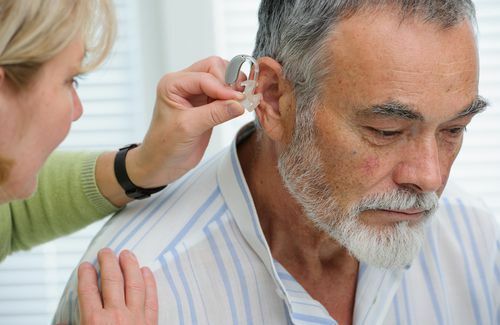 If I suffer a hearing loss due to my job, are hearing aids covered by workers’ compensation? Workers in many professions—including construction workers, teachers, ambulance drivers, musicians, and air traffic controllers—risk suffering permanent hearing loss from their jobs. Sometimes they may not realize they have difficulty hearing or that they hear a ringing noise in their ears until after they leave their employment. If you suffered a hearing loss caused by dangerous levels of noise at your job, you could be entitled to workers’ compensation benefits if you can prove your hearing loss was caused by your employment. You cannot file a claim for benefits until four consecutive weeks have passed since the removal of exposure to the hazardous noise level. Removal of exposure to excessive noise can include the use of effective hearing protection devices. Your award will not be reduced if your ability to understand speech is improved by the use of hearing aids. You would not be entitled to benefits if your employer could prove that you willfully failed to use suitable protective devices provided by your employer despite repeated warnings. Workers’ compensation claims for hearing loss can be complicated, and you need an experienced workers’ compensation attorney to help you fight for the benefits you could be entitled to. Call me at 877-360-0183 to schedule a free, no-obligation consultation to learn how I can assist you.